Prior to 1975, he Sea was around 36 in Hanoi Vietnam old town and sold to he expressed. During this time, the main squeeze is the focus of the army and the guerrillas her people, tanks, cars are very popular children next 12 animal and animal fun everyday. He remember once, a girl blubbered when he announced the review to war, her mother immediately took me out to he Customs expressed his thanks to the neglect of household is a focus of tai beo team hat, shoulder bandoliers porch the horizontal. Then the week your baby is demanding that his mother looking to squeeze the to he published. Type the characters express are always changing according to the interests of the children. Every watch cartoon character or hay, they are required to squeeze as Sun Wukong, Zhu Bajie, Na Tra, robotics. Many orphaned children have also asked his mother's protest image as a mother that I imagined. From the hair, clothes, all smiles as they thought. The squeeze at the request of the children has become increasingly popular. Mr. Hai said: "what's unique to he is the uniqueness of character, such as I have expressed a hundred times but each time the Qi Natural posture, not once does the same every time." Time ago, Mr. Hai is the SOS children village teacher in Hanoi with a kindergarten in Phuong Mai, Dong Da district, Hanoi city inviting for children to express and guide children in expressing collective the extra-curricular hours. Also, talk to me about what's unique craft to he expressed. It's a good time with Mr. Hai. The children get very excited about the cartoon characters, animals imagined in his mind the customs turned into reality. He shared, just imagination and love of children, who molded the character will have to he a soul alive. After the happy memories, he suddenly sighed Customs on the dates of their hardships. Vocational training to go to he is more, the festival or the town where markets populated. By going to make a living in the land of the stories were waylaid, driving change is normal. There are times, Mr. Hai was sitting on the street, the police arrested the gear box, because children are curious spectators causing traffic jams. Secondly encounter rain, loss of both lead and fishing. Every tree has value only to he from the 2000-5000 contract. Artisan Sea harness because if there is no way the conservation profession, only the near future profession to he will disappear. He is training hard to teach children and neighbors. The quick-witted as he taught, just eight months can bring the supplies to make pieces of rice galaxy. How much experience and technical know-how in the powder off, on, pasting, trimming how to get the material to he has his soul will pass on to young people. He and his people have found ways to improve the life of a tree to he from several days to a month over month there were some certain results. Now as old age, the artist Chu Van Hai friends with the guitar in tune period chau van singing for the elderly in the family ceremonies of temples and shrines. Mr. Hai improve Mieu now playing dance, music lyrics of the artist is not a school of music, listening to bureaucratic fascinating as the plants left to he done fascinated generations of children from the hands of craftsmen this flower. On 27/5/2009, the conference "Current situation and solutions to promote professional production values ​​of traditional toys Hanoi," held in the village of Xuan La, Master Le Vu Trong, Research Center and child support, made the startling figure: within four years, there were 84,000 cases of children with injuries caused by toys. Many cases of intellectual stagnation, mental disorders, eye damage, burns, poisoning, choking and even death. At the Institute of Pediatrics, nearly half of more than 100 samples airway foreign bodies are being reserved in pediatrics is the product of children's toys. It is estimated that in recent years "Chinese toys" accounts for nearly 80% market share in Vietnam, including many toxic toys, with exorbitant prices to the million. Then one startled look back to those he loved, little, a traditional game that old models, despite the manual for generations, is still here. /. Hanoi Vietnam has two molded to he was awarded the artist Dang Van and Chu Van Hai, is the village of Xuan La, Duc, Phu Xuyen - where the old legend lines between 300-600 years. To he children's toys, squeeze the seeds cooked pasta, are colored. Where to he, kids gravitate there. They are "the problem" and who expressed to he who "solved problem." Gióng St., Sun Wukong, dragons, birds, monkeys, elephants, tigers, leopards, double-martial, education ... are both injured. In previous years, the hobby is to he went with the children in both dreams. Supplies of real artists to he just a simple wooden casket, a few jars of boiled rice mixed plastic blood products, bamboo sticks and little old plastic chairs. All this is carefully tied on a bike every move. So, the folk artists on day wandering through the street corners, parks, ports for ... until after New Year's Eve to blow into the human soul to he small. To he who express a principle of the family is only passed to his son and daughter. Express comes to he long but because the material was burned copy should not find a particular job group. Moreover, in the village there is a lot like family, Nguyen, Vu Le, Chu, Zheng said that they always express to he. Hence the title of the job is always room for family deserves. Xuan La with time almost the whole village went to he expressed. They are traveling around the country, from Hue to Saigon, from Lang Son to Ca Mau, where there are people who make a living village. Occupation lang tarpaulins, each person choose a different place but still the largest in Hanoi. Hanoi to the zoo can see dozens of Xuan La craftsman, each with a corner, they quietly bought those seats and squeeze enough to he bright colors. Cycling about 30km to the capital that they can practice. Road bike sales away from the familiar. How many children in Hanoi were familiar. Children now play the favorite superheroes, sailor moon, songoku, pikachu ... than playing the familiar animals as buffalo, chickens, pigs. Many times people have to express to he enlisted read more comics, watch cartoons to vividly express that it satisfied the children but still have enough for 12 animal model for the guests. Expressing a to he takes about five minutes, which sold several thousand dollars, sometimes all day and only sold a few seeds, but they were conceived: the "how much interest but no per-view fun with the kids those to he other side, I also love my job more fun that spread. "Now, when Xuan La has become famous, visitors to the village is like the rustic look, simplicity of a child and found to he understand the history of villages, and then hand those to he expressed his love to bring back memories. Each brought to he went to Japan to participate in international fairs and village, but now most roots artist Dang Van Village is no longer enough to ride more street vendors. The sad memory at training, he was dragged out to he casket vocational training for children of five to seven flood. He said the job "market early last line" people do this cheat, it was off to fun festival, to expose his face on street corners to earn every penny. In the spring, the season is also the season of the artists make a living all the way to he. January begins with council, the Assembly Loa, within the Assembly Lim, then sink to the Assembly remote countryside. Often nights 30 nights festival is that artists earn the most in the village, but when people on the eve of the reunion, the artist wrong reverse the steps to he steps back home tired, when the inn . Many artists give up the New Year, sleeping on pavements, park benches next to continue along those traveling to he. People become artists to he of course had too much sun and rain and the flowers on each seed mix. There should freshly wash to he. Powder is molded to he nothing more to food, rice mixed with a glutinous rice, rolled several times for fine, smooth, and then dried to international water available there from the day before. Every morning air was powder with water and bring color into dough kneading maturity. Every season had anything that rotation. How hard but yet has an interest, he missed the child to play with chewing, swallowing you have to he, it does not matter. Powder were hot items cooked to the drag on as it pulled candy or cake thickness. The more carefully as plastic powders, more easily molded. Apprentices to he wanted to start expressing things. The lesson is simple. Xe dough around a toothpick for a bat. But it is to distinguish bamboo sticks St. Gióng not necessarily scholarship Sun Wukong, the way to other vehicles. Large vehicles such as the round cursive writing, there are bamboo sticks. The wheel is not uniform, pushing a preview of the bottle touch the powder in the bottle palm to her stylist for rough bamboo sticks. Want irons round the closed car, a song in that the dough is smooth means of two hands, before the cast are as square as a sharp one foot phuong.Khi has strong writing skills can apply for cards song that tiny bamboo weapon. Express items shall be used to move files manually squeeze the animal. Remains to he has a bamboo stick in, so before after only one standing. The four-legged animals are difficult to express, because they crawl but never stand! So squeeze the circus animals as well as interesting. To teach the dragon, snake, plastic bending around other bamboo stick to hit diaphragm even more, still to be bohemian. The cat then had to climb the bridge, to hug the tree that stands as the cau. Create the finished article from the new species move through all the labels, make sense for the human face. Express to he very similar to the art of opera mask painting. Symbolic, conventional high, medium red face The pair in silver / her flirtatious little fiber beard sparse horn. Squeeze to he can look to find out the relationship between art with folk theater. Prashant whether woodcutter cut flowers wood surface is mostly gray with static, not to he ngoet as Information Management. On the long white beard homesick, ear to belly large, the shape of how, in the application itself, the target market Liu. Quan Van Truong, face red as fire cycle, full beard constellation of meaning in mind ceremony credit, slanted eyes up, and still am Quac gentle, always cartridge size, hand kept the juniors with Liu Bei, not spread in arrogant finger pointing with two fingers that close, close-interstitial, which is thought carried over military way of life for returning soldiers. Has expressed Liu Zhang Fei to face the black and white, have bulging eyes, forehead rough, bearded tassel deposition. Since the veteran artist Dang Van To busy to Japan in red clay to he performed, gender folklore riet table drain to the restoration of this job. Have suggested, find a more sustainable materials to he, what is on rice! But opinion in the opposite direction also. More than 20km away from Hanoi Vietnam to the north, have a professional do the ancient village carved wooden craft, which has a long story about the specific job San, who was the first buildings to paint Saint Tan Vien faith with pieces of wood carved with a dragon, fish, the rookie general failure of the glass is still handed down forever. 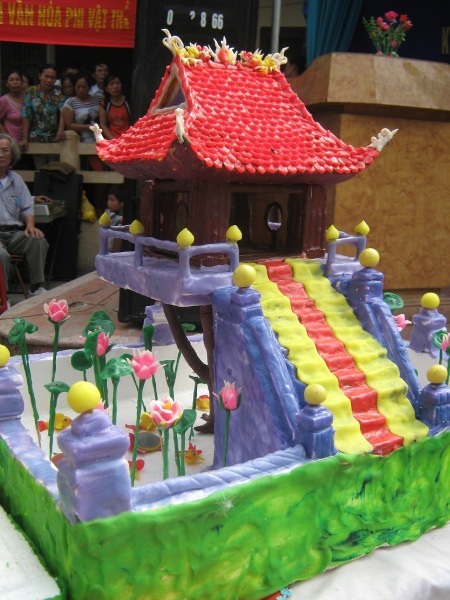 It is the village of Design Applications, Van Ha Commune, Dong Anh District, Hanoi. No one knows San instrument was, was like, just know that the main instrument was the first professional television Tip Set for Applicants to the village today, people in Hanoi, as well as four new tourist have the opportunity to admire the works antique wood carvings delicate, lively, full of art of village artisans Application Design. In the minds of the people of Application Design, carving wood carving seems to parallel the history and development of the village. Many skilled workers of the village was called Equipment Applications for participation in providing design, build palaces, tombs for the kings of the Nguyen dynasty level. Many of them are imperial Hue and rank the mission of Bac Ninh Ba permanent household products, typically implicit tool, a good mechanic in the village had been requisitioned to do in the capital of Hue, after work is completed , An ordained tri specific district, but because he wanted the job, specifically refused and returned to Hanoi to open shops in the town of Cotton. Now, these people have become old, but natural wood carving craft with the traditional secret shall remain timeless, as an eloquent testament to the enduring vitality of the ancient villages like Village Design Applications. Through the vicissitudes of time, including changes in its history, the village Application Design today is not always constant sawing English, German, man. These products are made increasingly more diversified. From the original bamboo ugly, rough, there is an attractive shape, and yet the talented hands, skillful artisans Application Design, has become a valuable statues, bewitching beauty . To switch of a wooden statue of the same template but it is not hard to convey the spirit, the spirit move into the new statue was a difficult, not everyone can do. Want to create a beautiful carved wood products, soulful, workers must first select the type of wood to ensure durability, difficulty bending or cracking. Grain must be flexible, smooth, beautiful polish, then wood is sawed, cut, carved, cell shape and size to do. With the new workers entering the profession, they must draw a pattern on paper, then in the wood for carving. As the skilled application of Design, only the first sketch of the main lines, so that the sign for the correct size and so are the patterns, motifs such as flowers, leaves, dragon, phoenix ... he just blows by , which is gradually cloudy puffs up like a vivid picture. Each line, the pattern of the statue bears the soul of the landscape and the relaxed nature of human village idyllic place. Like many naive people in the village bell land of Thanh Oai (Hanoi Vietnam), artist Pham Tran Canh life associated with hats, hats that he was born, grew up with hats. After months on the gun battle, when the body no longer healed he returned to the hat. And he was a conical basket with handle revive sport seemingly was lost after 50 years. Village Bell is a semi-mountain regions, the east edge of the Red River, the west into the mountains from Hoa Binh to Thanh Hoa. Small fields, some new inhabitants have a job, so hats pole field is the source of living. Artisan Tran Canh Pham was 82 years old, when a boy he learned to knit caps and hats. His grandmother, his parents living by knitting hats capital. He said, this business with the village bell natural as breathing, grandparents as parents do, children to follow, look at each other that do. Compared to material wealth, the people do not high-hat, a good job as his best month harvest only 600,000 to 700,000 VND. But the house you also know, from 90 years old to 10-year-old baby, who made the five, six hundred, who were two hundred thousand, the cumulative "worst cut was" also improve life. 4 / 1946 he Canh on the team. Early in 1951, our troops liberated Dong Khe, the French military defeat at the land border on the plain, they hunt the enemy team scattered in the area. He was a scout in the population, trying to penetrate the boots mapping situation. Exposed, he was arrested twice. Enemy torture but he kept a secret base in the heart of enemy resistance. Both times, he broke jail with you at the port 41 (Ha Dong town) and purple boots to return to war. In 1952 he was wounded in the battle of liberation, Phu Xuyen. Raw materials for hats are only three palm leaves, bamboo frame and plastic fiber charge the old days without charge, the particular stage of hook fiber stripped from trees Giang. There are two kinds of leaves, old leaves of palm trees brought from Phu Tho, the second is taken from the White leaves Ky Anh, Ha Tinh out. Bell only ancient village of old leaves, and white leaves emerging from 50 years, from the white cones arising from Hue became common. Leaves beautiful white light, with teenage girls but quickly broken. Hat age old traditional or team leader, reliable, private hat straps made of old leaves just sports. When he saw some old grandmother sports hat strap. In the village, the procession she go home, village festival or procession to the temples were handed sports hats. After the wars straps sports hats lost because no one uses anymore. In 1997, a delegation of public documents including foreign visitors seeking sports cap straps, after traveling many provinces from Ha Tinh, no one received as a hat. They arrived in the village of Bell questioned the economic, social and shook his head because from 1946, has 50 years straps are no longer doing sports hats, the old hat is not ancient. Out, he claimed do not know whether cones do not, he thought, before I know where that shooting stars on the team that shoots well, is hard to do much. He tried to imagine the days of small for my grandmother how to cap, but when it began work, pattern no longer exists, he must find it. Although only one day on his feet but still use the vehicle traveling all provinces babetta it to other provinces to form cones. He ended by being a woman in Dong Xuan, she found a hat that form a pagoda in Hanoi still kept. Back home, taking apart his hat to examine roads needle nose just like, how many round hats, a few leaves. So he restored the hat strap sport seemingly was lost. Sports straps hat has six stages, the first step is very meticulous work leaves called "swallowing." Palms in Phu Tho each month just to have a blue bud, cutting a three dry sunny summer that it turn blue to white. Then for the hun in salt kilns burning leaves thin white fluorescent and over, then bring the gang plow burned up in the fire, wrapped in a cloth is used on each leaf for flat. This is the most difficult, if that region is to fire, not white hat worthless. Stage two is the loop on campus called "pop" ring. Stage three is to use a conical thatch. Stage four is the stage, the villagers called the contraction cone bell. Stage five is the stage when cones are finished pouring the mold of the "tingle Scorpion" and finally decorate hats. After some time, the Lotus Hotel in Hanoi to put two hats 2m diameter to exhibit the two countries in Germany and Czechoslovakia. Cone diameter, the circumference of 2m to 7m, thanks to some support, both of them were two hat out for a month to complete. To foil hat, he asked for so many leaves from Phu Tho, each sheet is only a dozen selected for the longest tops 2m diameter cone roof, each side must have two or more meters long leaves. After being brought to the exhibition industry in the country, in addition to the hat making money, the hotel gave him a million. He thought to himself, that is the fortune of their native country with his new job is done, I was a Party member, is a soldier so that he supported the money for kindergarten in the village, an amount not less with him at that time. With the business of the village, he always kept his optimism by formerly think Vietnam has more than 20 million people, now nearly 100 million, although modern life, but users are still many hats. Those agricultural workers, outdoor workers should have a hat hat still selling. Now not only throughout the district where the village bell, the village does have a hat, as well as many sold out. This is the concept of his own happiness, and the whole village bell again. The Hanoi is no stranger to sticky add wine, aromatic, delicious, easy to eat but nobody knows that this is one of the traditional coastal village Nhue Organization (now the Ta Thanh Oai commune, Thanh Tri district, Ha Noi Vietnam). Here, most farmers are known as rice wine. They do not have to eat, but mostly for sale. There are hundreds of farmers to make this traditional craft. Every morning dozens of rice wine burden under the bus, do the inner-city car for sale, that's not including alcohol sales team rong, shoulder or bike ride to hang freely around the city Hanoi. The attractive village of rice wine is tasty Group, say the enzyme concentration, hunting round glutinous rice grains, air, fresh water, not sour. There may have broken any fresh (young men used, or compost is good) The villagers have to keep eating, "yield" of good for the galaxy. The old village where rice wine profession as that of the village is a long time. In such a sweet girl, modest, hard to make the village group, bringing traditional craft of making fine wine in the village. The villagers then ate that delicious imitation, learning to follow her. Rice seeds after the rash clean screen, the map nine twice, so cool, and the men to be incubated for three days, hunting and aromatic juice secreted and golden brown, warm and sweet aroma. When selling, rice caused a small bowl, and water to food reinforcement. Perhaps because that group of villagers call it "rice wine pick." The more you make smart quick cup full of wine, delicious, that floating interest. Otherwise it just takes awkward pick wine, cup of wine looks loss of appetite, has little interest. The village of rice wine over time, now has "innovation" pretty much the whole way, to sell, and quality. But still the same formula, but it was much simpler to manipulate, not picky as ever. Simple way, the whole village everyone can do. Dry yeast is commercially available full fair, nobody do men get picky. But most importantly, the villagers said, the current quality rice, the yield should run as far inferior to the former rice (including glutinous yellow flowers have been hybrid, to many degenerative ). Rice wine and perhaps more available, so sellers do not have to pick now to earn interest heels, but every contact a bowl rushing, or sell the whole weight (20 to 30,000 VND / kg) remained profitable. Except on "insecticides" (5 / 5 lunar calendar), now rarely met villagers sell rice wine I just do not. Enclosed with the rice wine, in baskets happy, carrying their goods always have all the alcohol level, national slip, fine marble, to meet the needs and pocketbooks of consumers. Alcohol rules are now only bring items to sell to people "crushing," or eat for pleasure. The owner of the cooperative Ta Thanh Oai (Thanh Tri - Hanoi) said, every day has to run for 70-80% of alcohol sales in the village of travel documents. They earn on average 35 to 50,000 dong profit / day, sometimes forget farming. In addition, the group of villagers went around the four countries to bring their traditional occupations of the village to the mountain, and coastal region. Many of the village women of the village has to do strawberries make Ho Chi Minh City Vietnam and southern provinces, bringing the flavors of his native rice wine. From 17.02.1947, Hanoi Vietnam temporarily occupied by the French. The Capital Regiment soldiers farewell beloved city, our vows seriously, "Back to liberate the capital." A few months later, officials, soldiers from the base population has settled back into the city to build the basis of resistance developing guerrilla warfare, breaking of lines surrounding the city, in the heart of enemy enemy , at the lair, the nerve center of the political graves of our military in Indochina. Guerrilla warfare in the capital has developed to the highest peak with the victory, typically match raid on the airport's Bach Mai Battalion 108 (night 18/01/1950) break 25 aircraft, fuel 60 thousand liters of gasoline, making enemies terror and the struggle of the students, the people crowded beaches during key supporters, mourning memorial Tran Van (from 9 / 1 to 01/20/1950 ). Since 1950, the U.S. imperialists to directly intervene in Indochina, increasing military aid to France. Therefore, the resistance of the capital's military increasingly difficult and drastic. Hanoi gradually recovered to rebuild the basis of resistance and struggle out conspiracy "to take the war culture wars, the Vietnamese use Vietnamese people beat" of the enemy; from there advance to coordinate with national battlefield in the war Strategy 1953-1954 and Dong Xuan Dien Bien Phu campaign movement captured soldiers; especially Gia Lam airport battle night 07/03/1954 and movement signed a petition demanding peace and demanding the government French government to negotiate with Ho Chi Minh city Vietnam. Hanoi People's Army has contributed significantly to the great victory of the nation, forcing the French to sign the Geneva Agreement, to recognize the independence, sovereignty and territorial integrity of the three countries of Vietnam, Laos and Cambodia on 20.7.1954. From here the struggle of the Party, Army and the capital's move to a new stage: Anti-sabotage enemy city, preparing forces to take over all aspects of the city. Under the direct leadership of the Party Central Committee and Party takeover, the Hanoi Party Committee led the strata, core workers, defense plants, factories, offices, against the enemy out dismantling damaged machinery, raw materials, carried important records, and also against the enemy forced migration to the South. After two months of fierce fighting with the enemy, we have kept almost intact machinery, equipment, records and materials in plants, factories, offices, hospitals. A majority of the Hanoi People do not take the bait lure the enemy, in the migration to the South await liberation. Under the agreements signed at the meeting in line losses, from 2 to 5/10/1954, the Administrative Team and the first order to prepare to take over public buildings, public buildings and military headquarters the police of France, the puppet authorities. From morning 6 / 10 to the way 9 / 10, France withdrew from the suburbs and inner city rolling way. 16 hours 30 minutes on 9/10/1954, the last French soldiers drawn through the Long Bien Bridge to Gia Lam. Night 9 / 10, the first night of peace, vibrant city in the forest and flowers. The morning of 10/10/1954, the Military Committee and the General Union City 308 in free capital. The same day, the capital's military flag ceremony at the court victory flag pole. Mr. Vuong Thua Vu - the commander of the Front to Hanoi 60 days and nights, on behalf of the Military Committee to read the call of President Ho Chi Minh: "After the big changes, the restoration of normal life often complex, difficult. But the government is determined, the entire concentric fellow Hanoi, agreed to contribute to the Government, shall we be certain beyond all difficulties and achieve a common purpose: to make a capital Hanoi yen stability, cheerful, prosperous ". August Revolution victory, on 09.02.1945, at Ba Dinh Square, President Ho Chi Minh read the Declaration of Independence and the birth of the Democratic Republic of Vietnam, Hanoi Vietnam became the capital of the country. People's democratic government has recently formed to deal with the enemy in collusion with foreign enemies plotting to overthrow the government of Ho Chi Minh. Facing the danger "hanging hair", under the direct leadership of the Party Central Committee and President Ho, Party unity has made capital "and national resistance" against hunger, illiteracy, foreign invaders, build and strengthen the protection of the revolutionary government, defeat all schemes of imperialist Anglo-French-American-Chiang reactionaries and their henchmen, the new regime to protect, maintain an social order and security in the capital. In those days this tough, the Party Central Committee, headed by President Ho Chi Minh city Vietnam, has advocated "peace for progress", signed a preliminary agreement with France (03.06.1946) to pursue soldiers return home , and the necessary time to prepare forces for all aspects of the war against the French, sooner or later will happen. On 3/18/1946, 1,200 French troops are allowed to play in Hanoi and the prescribed position. Shortly after entering the city, the French generals of military planning and gradually occupied the city, proceed to overthrow the Government of the Democratic Republic of Vietnam, Vietnam invaded again. From 18 / 4 to date 12/5/1946, the Government of Vietnam delegation and the French preparatory meeting in Da Lat prepare for truce talks. During the meeting, the Government of Vietnam delegation has fought to expose the conspiracy of the French to remove the Preliminary Agreement 6 / 3, an attempt to restore colonial regime in Vietnam. After nearly a month, the meeting deadlocked stubborn attitude of the French delegation. From day 6 / 7 to date 3/9/1946, Vietnam delegation led by Mr. Pham Van Dong, head of the delegation to France to attend the Vietnamese-French negotiations in Phongtennoblo. Do stubborn attitude and aggression of the French, talks between the government delegation failed. President Ho Chi Minh signed a provisional agreement with the Government on 14 / 9 for the necessary time to continue building their forces and prepare for the national resistance that people know for sure will happen. Before the new situation and new demands of the revolution, the Party was to strengthen the Party System, the National Front government agreed to the city of neighborhoods, villages, development of extensive political force moreover, on that basis, strengthening the armed forces to strengthen the capital of three troops (Defense Corps, fought in Safeguard Hoang Dieu, largely in defense plants, factories, neighborhoods, villages). Since the national conference of the Military Party (19.10.1946), the capital of Hanoi to prepare resistance. January 11/1946, the Central Party divided the country into a war zone 12; XI Hanoi war zone. The city became battlegrounds. The capital of the armed forces (5 Defense Corps battalions and 9,000 self-defense) with weapons is charged detained enemy foot and consumption in the city for some time, at least one month, enabling Party and the North Vietnamese government to withdraw safely. 20 hours 30 minutes on 19/12, the capital's active troops opened fire, beginning with the national struggle, against the French invasion. From 19/12/1946 to 17/02/1947, 60 days and nights of fighting, keep each roof, street corners, in the spirit of "Better dead not be slaves," "death decisions for the country of birth", Hanoi's troops in 2000 destroyed the enemy, successfully completed the assigned tasks, defeating conspiracy to destroy the headquarters, to conquer and master the city in 24 hours of French. The victory of the battle begins 60 days The war is victory of people's way of war, the people, full of the Party's victory is a tradition of patriotism and revolutionary heroism of the troops and people of Hanoi. "This is a glorious opening of the great wars against the French, contributed to that tradition-Dong Thang Long-Hanoi. The land of Thang Long- HaNoi Vietnam -Dong history of long life. Over the time "beach pool princess bride," To date, geologists have tried to Vietnam to restore many of the changes. However, if further back every few hundred million years, at a time when the Earth was wild roses are my changes, when the display is still raging dinosaurs, the resource is not allowed. The closer this day, the evidence collected more and more levels to restore accurate. Thus, history can be divided into the regions of local flexibility of this masterpiece to the stage of research. According to geologists, the Earth's crust is the top but the thickness of the crust is not uniform in different regions. On the continent of its average thickness is 35 km, 10 km below the minimum, maximum is 70 km. Such difference depends on the altitude of the terrain: the mountains where it has the greatest thickness can reach 70 km (1.1%), the delta between 35-45km (up from 0.47 to 0 , 7%), while on the ocean floor thickness this peak is 10 km (up 0.15%). If ocean areas, including its water layer, the thickness is only about 20km (up 0.30%). The surface distribution of the lower crust with depth (called the mantle of the Earth) is called on Mohorovich (name of a geophysicist with the former Yugoslavia) and called Moho surface. Thanks to the seismic data and gravity as well as the structure itself of the rocks, is divided into continental crust and oceanic crust type. Crust is composed of three layers of material of different density. Continental crust has an average density 2700 kg/m3 and is divided into different classes are: basalt layer, layer "granite" and sediments. Generally, the lower part of the crust are two classes: basalt and granite, in the upper sediment layers form the foundation of the territory. At the HaNoi Vietnam, on the Moho is the northwest - southeast extends to the southeast of the northern gulf coast and northwest of the Vietnam-China border at Lao Cai region. So thick crust along this zone may also change. In the Tien Hai (Pacific), its value reaches about 28-30km, at the Hanoi area reached about 32-34km, and in Lao Cai region reaches 40-42km. 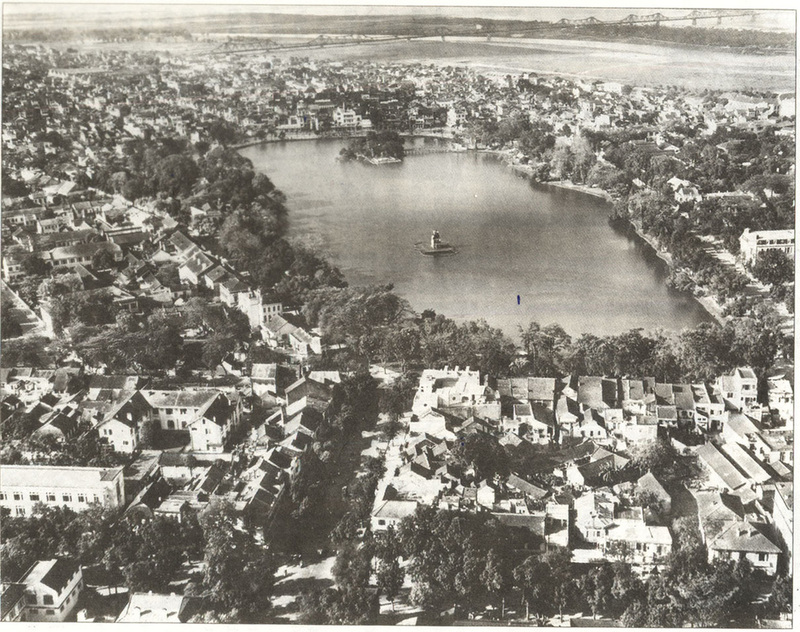 Foundations before Kainozoi of Hanoi and the surrounding area with a very complex and is located at different depths. This foundation is the damage and fracture depth is divided into several blocks moving relative to each other both vertically and horizontally in the direction and the formation Kainozoi were coated with different thickness. Kainozoi period before the period form the solid foundation of Vietnam's territory, the northern plains, including the land of Thang Long-Ha Noi-Dong. This stage lasts a few hundred million years. The geological features and landforms of this period is explained by the evidence remains today and is associated with the evolutionary history of the Delta. It rocks exposed in the hills, low mountains of Phu Tho Province and the rest sank below the delta area of ​​the city of Hanoi. The oldest geological formations of this period largely fall into the modern topographic surface. Currently, the ancient metamorphic rock is composed of gneis, marble, quartzite, amphibolite ... only in boreholes in the North, East England North West town. The stones are arranged into flowing river floor was created before the Cambrian (N-P1sc) million years old from 1000 to 520 million years ago. Next, the participants make up the foundation trenches consolidation of hollow place in Hanoi, there are a creation of the University of Central students (Mesozoic). Within the territory of Hanoi, the formation is also exposed on the steep slopes and adjacent Soc Son District. That's the kind of continental sedimentary rocks erupted raw mix is ​​deposited in shallow marine coastal environment in an age Trias, Jurassic and Cretaceous Central University students (Mesozoic) today to 200 million years or less. - The stones of the old village system Kun-storey mid-Triassic (T2kl), to this day over 200 million years. It is the original green stone (sand, powder, powder containing volcanic fall, with the eruption lenses acid (trachit, ryotit porphyr and felsit) distribution of the mountain in Ve Linh Mount Dom, Mount Store Forest, mountain birds, pigs Mount Ham, Double Mountain. total thickness of the layer system is from 650-845m. - System Na Qu is the stone floor of an age between Triassic (T2 nk), is transferred from the stone floor of the system to Khon Village, a 200 million year on this day, distributed in the northern mountain range in western North Soc Son District. The lower part of the system is the sandstone layer, powder, light gray clay, moved to the top mainly sandstone, gray powder and red-brown clay. The rock contains a lot of fossil foot axes. The formation of Na Qu floor system has a total thickness of 600-940m. - Ha Coi tier system. The rocks of Early Jurassic age tier system - between (J1-2hc), also by about 150-200 million years today. The stone floor of the system is exposed discontinuously in a narrow area of ​​low hills west of errors Hien Tan Dan Ninh and Soc Son District. The composition of the rocks are pebbles, gravel, grit and breccia lenticular, coarse-grained sandstone layers of gray-brown, pale yellow. The whole floor is 120 meters thick. - Lung Tam tier system. The volcanic rocks ryodacit, ryolit porphyr gray of the schistosity forced us to this old story late Jurassic - Early Cretaceous reveal a narrow area, distributed in the Nam Cuong, Hien Luong, also director of Soc Son District. The thickness of the ice observed around 100m. Thus, the total thickness of sedimentary formations in the Great Central was born on the territory of Hanoi at about 2,000. The layered rocks are composed of dislocation and later create small fold or be divided into blocks to move relative to each other by the fracture. In rocks of volcanic origin containing kaolin minerals. Regarding time, this is the last geological period in the formation of the solid foundation of Thang Long-Ha Noi-Dong. To achieve the state's solid foundation, this country has gone through many ups and downs transformed by different tectonic cycle. In the operation of the Red River fault system plays a very important role. Before the occurrence of local subsidence of the trench lying on the stage Kainozoi Hanoi, Red River valley area in particular and the majority of the territory of North Vietnam is generally a block of continental unity was the separation process and denudation by the operation of surface water. That's why there are no geological formations that early age Paleogen (Paleogen - or about 60 to nearly 50 million years ago) to participate on the design of foundation trenches in lowland sites in Hanoi. According to the geologists call, the first stage Kainozoi, local pride lowland Hanoi has undergone several phases (cycles) of different tectonic. Each tectonic cycles are started by the phenomenon of subsidence and sediment accumulation process will occur, then raised and the phenomenon occurs denudation process. Therefore, in this period (which can last for thousands of millions of years - from the Precambrian to Triassic) has happened many such cycles. However, the phenomenon of cycles were repeated after the first cycle, but at a higher level, more complex and more and more complete. So far, the literature on the history of low-lying local tectonic trenches Hanoi in the period before Kainozoi still very poor, because of the low-lying hard nails are also located at a depth of 5,000 m to above. The formations involved in nail texture also vary in age and lithological composition. Therefore, to have a right to comment on this issue, the current document is not allowed. But an important thing to consider is, at this stage Chay River fault system, the Red River fault ... existing and long-term operation so far, so many geologists have called the Red River fault system (common to the fracture on) of a kind multi-cycle through the process of formation and development of simple to the complex of the northern lowland sites in general and Hanoi in particular proud. If the expression of all phenomena and tectonic processes in the period lasting for billions of years will be very much. Therefore, on the basis of the collected material, can come to the conclusion that the tectonic evolution of low-lying local pride in Hanoi before Kainozoi period is the period of preparation and complete hardware facilities initial decision to create pictures of areas Hanoi today - that is accumulated on to the next stage of Kainozoi there are sudden qualitative. Decision on 09.01.2008 02/2008/QD-UBND of Hanoi Vietnam People's Committee determined on 19 / 1, will officially manager of vending operations in the city. The pen until 21 / 1, Office of Hanoi City People's Committee reported back the backward message on timeout. According to proposal of the Department of Commerce, on 04/01/2008 Decision on a new implementation. The pulse around this is problematic, especially to manage vending operations is, in the time interval from now until the official Hanoi much the right properties. 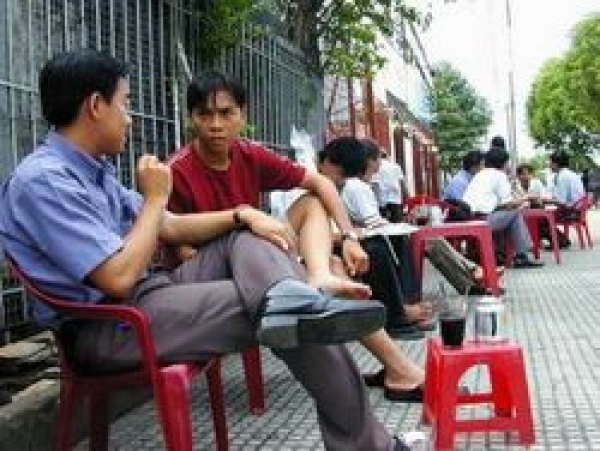 As no complete statistics of the Department of Trade, now the city of Hanoi interval 10 thousand street vendors. 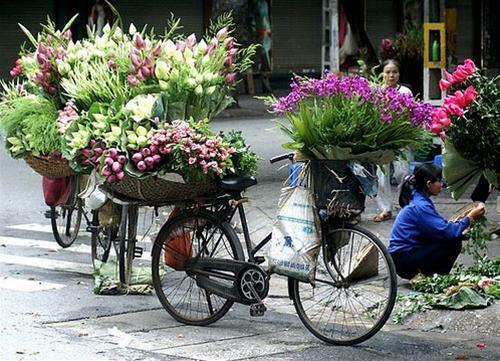 The number of people selling vegetables, flowers, fruits used interval 90%. Total sales of groceries, food drink have no more pencils. The number of active vendors regularly used only 40% interval, the remaining 60% is the time to service activities. Pulse around the manager of vending operations in accordance with Decision 02 of the Hanoi People's Balance Comment poses many problems. Duong Thi Quyen, students of Hanoi Medical University for the truth: Every seaweed can be seen as an old culture of Hanoi capital. Sitting on the pavement eating bean noodles, shrimp paste ... of the three, the vendors she be considered a hobby of many people, especially pupils and students. This dish is not only delicious but very handy sometimes ... so to let it exist. Also have to point that, Vietnam is agriculture, the principles at the vendors in the capital of a country road might Agriculture is to let it course and development, as the economy - our society the max, add-ons from various types of advanced services such as stores, shops, supermarkets ... incremental LAN will operate vending. However, many ideas for truth: Prohibition hawkers in the city is the necessary, by street vendors not only give the beautiful urban, sleazy image as the capital of Vietnam in the eyes of the out that it is also one of the sau give cause congestion, traffic accidents in Hanoi message on the last time. At an angle different degrees, Dr. Nguyen Van Long, Bach Mai hospital for truth: Every rong there is potential risk of disease transfer, by the Most out of foods, food and drink vendors so make sure not hygiene and food-a ... Most Balance rằng comment for at an illegal street vendors on the streets of Hanoi and the management planning vendors in the Region is the situation allow, reasonable. The backward time management plan is appropriate vendors. Undeniably, more and more cafes are built to meet the different tastes of customers to achieve best business performance in Hanoi Vietnam. However, there are still many coffee corner "strange" and "interesting" but not everyone knew. Referring to the coffee, many people will think of the image blur bar or luxury residence. Undeniably, more and more cafes are built to meet the different tastes of customers to achieve best business performance. However, there are still many coffee corner "strange" and "interesting" but not everyone knew. As many young people prefer to look for the cafe fades to "confide" or bustling to show the dance steps in music personalities fell beautiful, the coffee Quat is a unique spatial differences, bring culture to Chang'an in Hanoi. Quat cafe located on Tran Vu style has a simple close range the lake has a few places there are. Like sitting in a cozy atmosphere, the moisture can enter the home. The special and most enjoyable coffee Quat visitor is able to more easily see the sign "No hugging colorful shop" on the wall. Strange, but surprisingly this is kind of "informed client recruitment" should be someone familiar with customary satisfaction also unique because of explicit prohibitions, this interesting. Just with simple furniture, the hot cup of coffee aroma radiate warmth, it became the destination of many people daily Hanoi wants to find a private corner to chat (not held) or reflect of paths of life. According to our correspondent, the coffee here is formulated as a particular method. The owner himself purchase of roasted coffee beans, ground to create very distinctive taste of coffee without a coffee shop Quat can not obtain. Also consistent style so simple and very ordinary prices. "I'm not afraid of losing customers because our customers come mainly from Hanoi original. Persons culture will surely want a particular angle is respected, not like people hugging each other, in front of her colorful shop, "he shared owner Quat. A man received a café "for life" here, said: "Born 30 years ago, Coffee Quat has become one of the famous address in the 'drinking culture' in Ha this into that! "